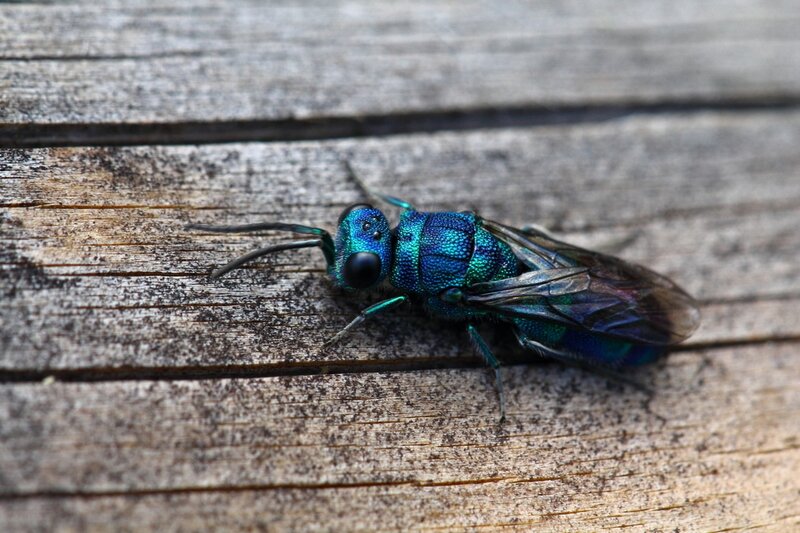 Eucharitidae (Hymenoptera: Chalcidoidea) is group of wasps unique as the only insect family comprised solely of ant parasitoids. Parasitoids consume a single host, eventually killing it. The larval eucharitids eat the immature ants. Some eucharitids (genus Orasema) attack pestiferous ants such as the fire ant (Solenopsis invicta) and the little fire ant (Wasmannia auropunctata). ​Eucharitids are found almost worldwide. 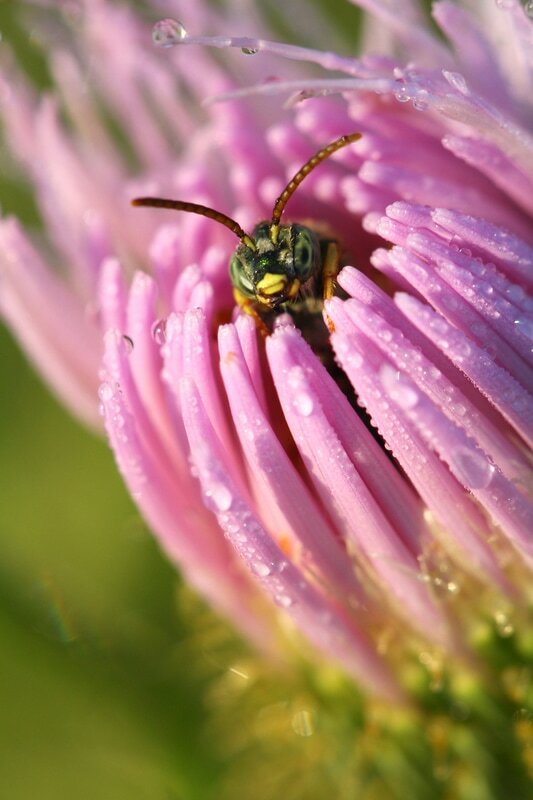 There are currently over 500 species described. 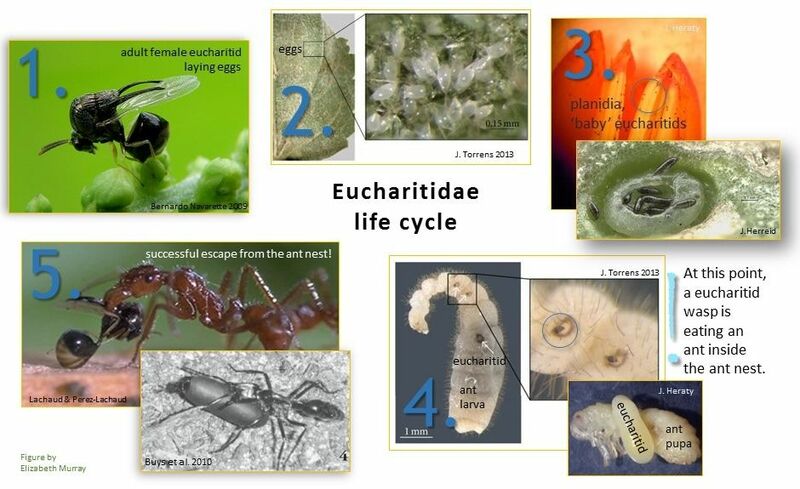 Particular groups of eucharitids are parasitoids of specific groups of ants -- typically exhibiting host specificity at the level of ant subfamily. For my PhD, I used molecular (DNA) data to estimate the age and evolutionary relationships of Eucharitidae, with a focus on the New World Kapala clade, a group of 14 genera. There are a few rare genera of New World eucharitids that I could incorporate into phylogenetic analyses only by way of coding morphological characters using museum specimens, but otherwise I used a dataset of five genes for the majority of analyses. I also explored aspects of the ant host associations, historical biogeography, and lineage diversification of the eucharitids. The ant phylogeny and the eucharitid phylogeny are 'matched up' to demonstrate patterns of eucharitid genera attacking ant genera. The lines are colored by eucharitid clade (grouping). 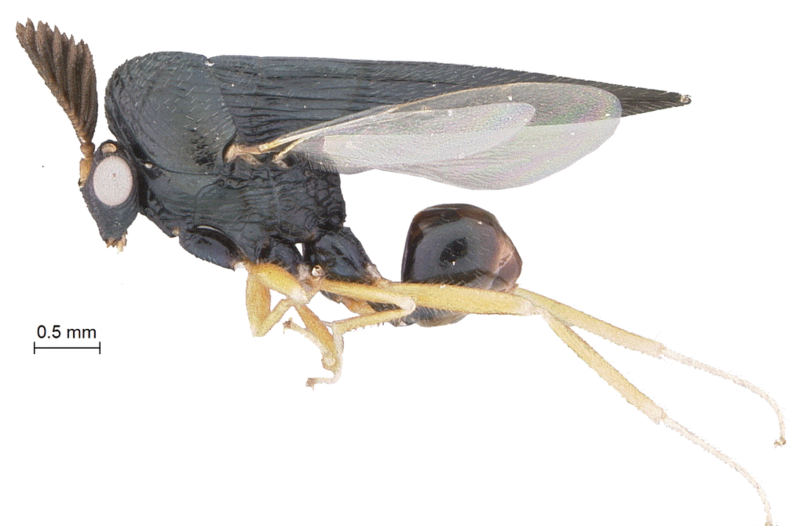 Host-parasitoid taxonomic associations, from Murray et al. 2013, supplementary Fig 2. Tanglegram of 29 eucharitid genera and 23 ant genera. Only genera with parasitoid-host associations are included. Patterns of host use emerge at subfamily level and below. Although there is not a strict 'co-phylogeny', we found that a clade of eucharitids generally all parasitize the same types of ants, even across the world! Formicidae cladogram on left adapted from Moreau et al. 2006, ant image from antweb.org. Paratrechina and Calomyrmex placement estimated (dashed lines) because terminals were not included in original phylogeny. Eucharitidae originated after their ant hosts. Though the eucharitids are not a 'young' group, at >72 million years old, ants are likely >125 million years old. Across the eucharitid family, there were several (probably 5) dispersal events from the Old World to the New World (North/Central/South America), all estimated to have occurred in the past 35 million years. 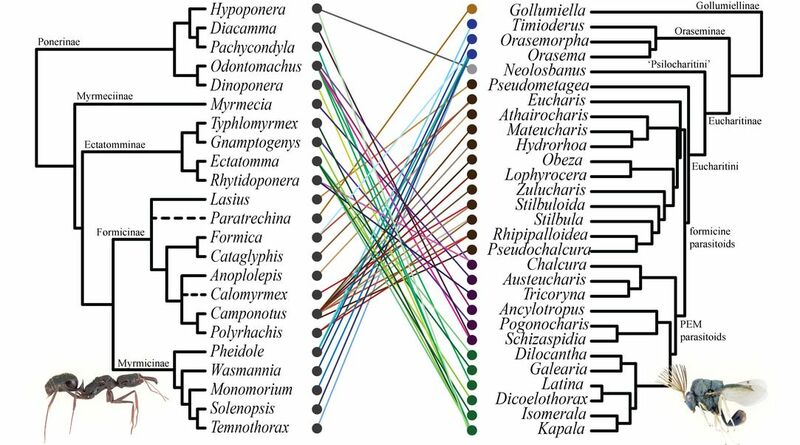 John Heraty at UCR is heading up a project (National Science Foundation grant) to use next-gen sequencing (anchored hybrid enrichment and transcriptomes) to produce a phylogeny on the superfamily Chalcidoidea -- and there will be plenty of eucharitids represented. The overall project is really cool in its emphasis on describing and incorporating hundreds of fossils, and in that a comprehensive book will be produced with keys and info on all the chalcidoid families. Heraty, J.M. (2002) A revision of the genera of Eucharitidae (Hymenoptera: Chalcidoidea) of the world. Memoirs of the American Entomological Institute, 68, 1-359. Heraty, J.M., et al, incl. 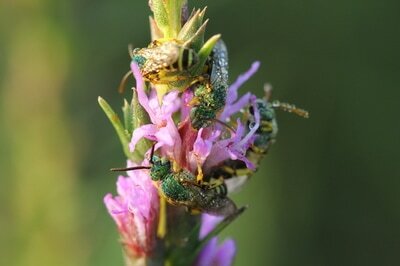 Murray, E. (2013) A phylogenetic analysis of the megadiverse Chalcidoidea (Hymenoptera). Cladistics, 29, 466-542. Murray, E.A. & Heraty, J.M. (2016) Invading Africa: a novel transoceanic dispersal by a New World ant parasitoid. Journal of Biogeography, 43, 1750-1761.
also: John Heraty has a website with a list and PDFs of 100+ eucharitid publications here. The image at top is a male Thoracantha, a genus from the Kapala clade. This species is from South America. Images copyright Andrew Murray (my brother). Solitary bees & a cuckoo wasp.